I stopped by Dollar General the other day and walked through their Christmas aisle, and within two hours I had changed the green sweater I was wearing that day to this pretty Christmas sweater! I’ve got problems, I know! But I think it’s going to be a great motivator for my students during the last week before Christmas break. I am always looking for new ways to motivate my immersion students to ONLY speak Spanish. 1) Write the phrase “Feliz Navidad” on the board. 2) Hang up my ugly sweater somewhere in the front of the room. 3) Erase a letter every time I hear English. 4) If my students still have a letter remaining by Thursday afternoon, I will be sporting my ugly Christmas sweater on Friday. What do you think? If you find dressing up fun, I’m sure you’ll love this idea. And of course there are a million goals you could set for your class to reach in order to see you wear your Christmas sweater. 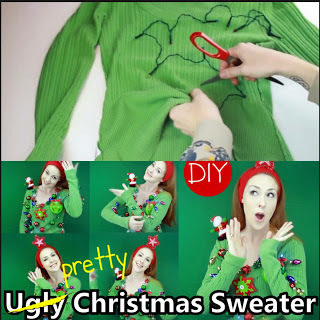 To see my ugly Christmas sweater DIY tutorial, just click on the video below! And subscribe while you’re there for more FlapJack craziness!